So fasten your seat belt, because we’re about to look at each part of this journey together so you'll then be able to turn your online visitors into longtime customers! More specifically: Making visitors aware of their problem. To understand this better, let’s assume that you have an online business where you educate people about photography. On your website, you offer some free e-books and sell an online course about photography. And, naturally, the end goal is to sell as many copies of your online course as possible. When you put out photography content: Who do you have in mind as your target customer? Who is the exact person you want to educate through your content? In my book "Small Business Marketing Made EZ" I lay out the ACTION Marketing System, which is a simple 6-step system to get your marketing into ACTION. The "A stand for ATTENTION. It all starts with defining your "who" - who is that perfect customer, client or patient for your business? Knowing this is crucial to the success of your business and if you don’t know who they are, your business won’t have legs to stand on. You can grab a free copy of my book here. In our case, the prospect we are targeting could be a guy (let’s call him Tom) who just got a professional camera as a birthday gift, but doesn’t really know how to use it. Tom always liked the idea of becoming a skilled photographer, but never pursued it. Now, he’s willing to learn how to use his camera and is ready to invest in it as a hobby. Your job now is to get Tom on your website. You have exactly what he needs, you just need to let him know you exist. To do this — to get traffic on your website — you can choose between using paid solutions or trying to get traffic organically. Organic traffic refers to visitors that land on your website as a result of unpaid (“organic”) search results. Visitors who are considered organic find your website after using a search engine like Google or Bing instead of being “referred” by another website. You can find out what keywords should you focus on in order to allow Tom to easily find your website when he’s searching for ”photography tips” on Google. On the other hand, paid traffic is any kind of traffic you have to pay for, whether we are talking about Facebook ads, Google ads, Pay-per-click advertising or Pay-per-display advertising. At this stage, your goal is to get Tom on your email list, turning him from a simple visitor into a lead. How Does a Visitor Become a Lead? A lead is a visitor that has converted into a subscriber - To achieve this, you’ll need Tom to give you his email address. The best way to earn Tom’s email is by sending him to a Lead Generation or “Squeeze” Page, where you’ll offer him something free (like an e-book) about “Photography for Beginners”​. It’s a win-win situation: Tom gets to learn about basic photography techniques for FREE, and you earn his email address. The “free e-book” that you offer Tom is also known as a Lead Magnet. As the name suggests, it’s designed for the exact purpose of helping you gather more leads. However, in order for the lead magnet to be super effective, it needs to be exactly what Tom is looking for. If you’re using paid advertising, it’s pretty simple. So, on the Lead Generation Page, it’s important not to distract Tom with unnecessary elements like animations, widgets and other calls-to-action. Instead, focus on creating a streamlined landing page focused on the benefits your lead magnet will bring Tom. Let’s say that you’ve SEO optimized your blog posts and Tom discovered one of them while he was searching for “photography tips” on Google. To convert him from a reader into a lead, you can deploy a lead generation tool known as a “Content Upgrade”. A content upgrade is a complementary piece of information your blog readers can download in exchange for their email address. In your case, the content upgrade might be the free photography e-book. The secret is to stir up Tom’s curiosity in the blog post so that when he sees the content upgrade, he’s eager to get it. This is where the magic happens: It's time to make Tom an offer to buy your product… like an online course about photography for beginners! Let’s go back a few steps, right after you offered Tom your free e-book about photography. After he gives you his email address, you send him to a “Thank You” page. This is where you thank him for signing up as well as let him know that email containing the free e-book is on its way. But here’s where you can spice things up a bit. Below the typical “Thank You” message on your thank you page, you can also display an offer for your beginner photography online course. According to Direct Marketing Association’s 2019 consumer email report, when asked whether consumers like receiving certain types of content from brands, 75% of respondents said they like discounts and offers. So, now that Tom is in your email list, why not take advantage of it? After he got his hands on your free PDF, you can offer him the Online Course on the Thank You page, as we mentioned above. But, if he doesn’t take your offer, nothing is lost! If you give Tom a little time to go through your free e-book, he will see that you actually know a lot about photography and may start to feel he has a lot more to learn from you. Highlight a few of the key takeaways from your e-book. Then, when the time comes, you can start sending Tom emails that contain soft sales pitches about your Online Course. This is a great strategy because most people will feel more comfortable buying products AFTER they’ve come to trust and value the person or company selling to them. It’s important to avoid making your promotional emails different from your content announcement emails that you send to your followers. Think how weird it would be for Tom to receive normal content emails that he enjoys reading, but then gets a weird, super-colorful email packed with promotions and flashing lights. He’ll wonder why on earth he ever subscribed to your email list in the first place. Set up a Free Photography Webinar. This will allow you to drop some photography knowledge bombs on your users — live and in person. And after the webinar is over, you can even use the footage in one of your online courses or Youtube and/or blog content. You can also use free webinars to draw attention to the Online Course that you sell on your website. However, be careful not to give off a salesy vibe when doing a webinar. Instead, try to emphasize the educational content you’re providing over the online course you soft sell at the end. Try to trigger Tom’s curiosity by talking about some cool photography techniques while also giving him the impression that “there’s a whole lot more where that came from — if you take my online course." This is the last stage of the funnel, but it’s by no means the least important. Because even if Tom has decided to buy your Online Course, he’s not your customer just yet. If Tom doesn’t have a good purchase experience, you may risk losing him for good. Just think about your own experience. Were you ever about to spend money on something that you weren’t 100% SURE you really needed? If you then encountered any sort of payment problem, you probably dropped the whole purchase right there and bounced. That’s why you need a seamless online payment process for the products you sell online. Testimonials are very important to an online business because they serve as social proof. This is why, after Tom has purchased your Online Course, you need to give him the ability to speak his mind about your online course and leave you a testimonial. Of course, in order for him to leave you a testimonial, he needs to go through your actual course first. So, you can either display a testimonial capture form somewhere within the course (either at the end of the course or at the end of certain chapters) or you can send him an email at some point, asking him for feedback about the course. 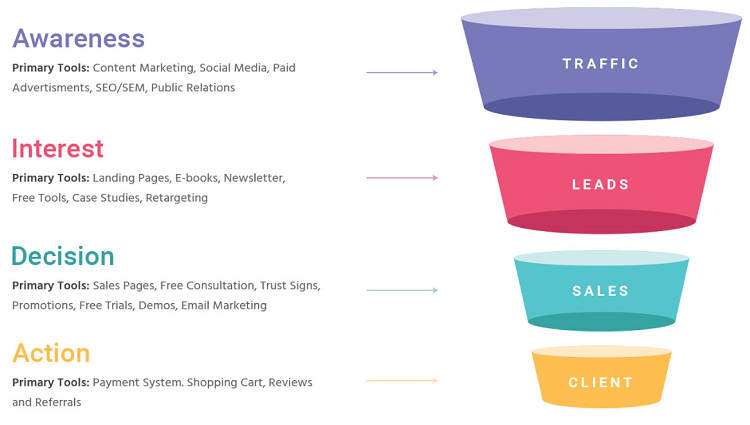 Now that you’ve seen the breakdown of all 4 stages of a sales funnel, it’s time for you to create your own so you can take your visitors on a high value journey! If you have any questions about the stages of the sales funnel I described above, leave me a comment below and let's have a chat!